L.A., etc...: Good Food 24 Hours a Day! The Kettle is a cool little coffee shop just down the street from the Manhattan Beach pier open breakfast, lunch and dinner. They serve a wide variety of food 24 hours a day, everything from Bacon & Eggs to Blackened Chicken Penne. The Kettle boasts an extensive beer and wine list, as well. Try to sit on the large outdoor closed patio, where you can hear the sounds of the nearby karoke bar. 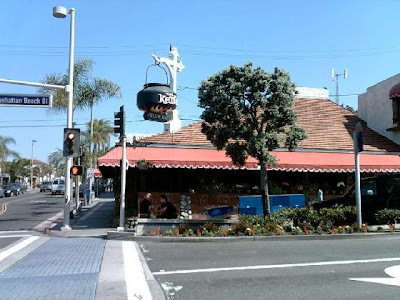 They are located at 1138 Highland Avenue in Manhattan Beach. Call (310) 545-8511 or click the title link for more info. High School memories...*sniff* has it been 10 years already! !